FEATURED ARTISTS: Vidaria / Yukiko Adachi / Victor Pross / Jeannie Priscila / Behzad Kian / Ali Casey / Tyler Pentland / Lisa Penz / Madeleine Wynne ... stay tuned! 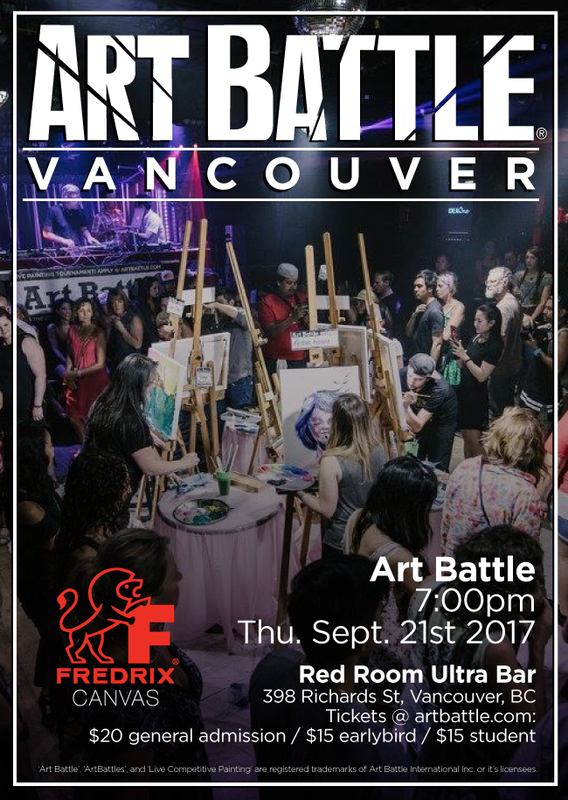 *Thank you to Fredrix Artist Canvas for sponsoring the materials for Art Battle Vancouver! Congratulations to Art Battle Vancouver - Sep 21, 2017 Champion - Jeremy Henrickson / Art of JPH! Art Battle® is live competitive painting. Painters create the best work they can in 20 minutes. As they work, patrons move around the easels, closely watching the creative process. The medium is acrylic paint and the tools allowed are brushes, palette knives or any non-mechanical implements. At the end of the round, the audience votes democratically for their favourite painting and bids in silent auction to take the work home. Art Battle happens in 50 cities worldwide, check artbattle.com for local listings!